In many ways, content intelligence is akin to performing extensive market research. It’s designed to take all of the guesswork and some of the potentially expensive trial and error out of identifying and catering to your target audience. Think of content intelligence as market research for the 21st century. Over twenty years ago, Bill Gates was one of the first innovative thinkers to acknowledge the potential and importance of content intelligence. But even he couldn’t have predicted just how critical content intelligence would be to successful online marketing. So, what exactly is content intelligence? Let’s dive right in! Simply put, content intelligence is a computerized software platform that uses a mix of artificial intelligence (AI) and data-driven research to help online marketers create workable content strategies. In a nutshell, content intelligence gives you important insights into how well specific pieces of content (i.e. blog posts, videos, infographics, etc.) are performing and how your target audiences are responding to them. Content intelligence can also give you an idea of which content pieces are worth improving and focusing on as well as which ones you should forego entirely. The first step to creating engaging and compelling content is to identify exactly who you want to deliver your key brand messaging to. In other words, what type of consumer does your target audience consist of? Which demographics are you trying to reach? Are there more than one? And most importantly, which demographics are actually responding to your content in a positive way? These are all important questions you need to consider when mapping out the type of content you want to create. Unfortunately, this is where a lot of content marketers fall short. A strong content marketing plan that includes complete web site audits on a regular basis can help you figure it all out, but it may take some time to find your groove. As the saying goes, patience is a virtue—but so is hard work! Start by releasing content that pertains to your industry and specifically, your brand. Your content should be timely and relevant to keep people engaged and interested. Next, evaluate how people are responding to the content, as well as who is interacting with it in the most positive light. This is your target audience. These are the people you want to keep engaged. Target audiences will inevitably evolve over time as new and relevant information continues to come out, but never forget about those who were with you from the very beginning as they form the foundation of your customer-base. Disorganized and unintelligible content just looks sloppy and this doesn’t bode well for your brand image. Your web site and all of your social media platforms should be easy to navigate and completely up-to-date. The best way to get all of your online accounts under control is to map out every piece of content from start to finish. This includes creating outlines for all content, conducting ample research, and producing high-quality content that your target audiences can relate to. Content marketing requires a lot of data-driven research and that entails far more than simply looking at your analytics. It also means actively engaging with your target audience, asking for feedback, and actually implementing their suggestions. In other words, give the people what they want. If you notice a trend that your shorter content pieces are performing better than longer content pieces, than take notice. Take a look at your high-traffic pieces of content and focus on updating them on a regular basis. Content mapping can help you organize all of your content and easily track which pieces are generating the most interest and traffic online. It can also help you determine what kind of content you should continue focusing on for future endeavours. 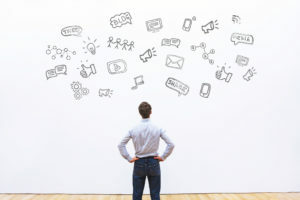 Right now, effective content creation involves a lot of guesswork, trial and error, and even failure to some degree—probably more so than a lot of content marketers are willing to admit. If properly implemented, content intelligence can change all of that. Not only can it help you predict the types of content your target audience wants to see and track performance, it can also help you determine the best methods of exposure by playing directly into the sensibilities of your target audience. What are the members of your target audience searching for the most online? How are they responding directly to the content you’re creating? Is it generating meaningful interactions online? Online subscription providers and video-sharing web sites, such as Netflix and YouTube, figured out this formula a long time ago and have been harvesting it ever since. It’s no coincidence that these sites are able to predict the type of content individual users are interested in and then make suggestions based on those interests. Content suggestions are highly calculated and tailored to each individual viewer with the sole purpose of keeping them engaged. And this is all perpetuated by the use of content intelligence platforms that carefully measure and track what each viewer is doing on various web sites and platforms online. Each and every suggestion and advertisement is targeted not to a wider audience, but to each individual user. After you’ve successfully identified and built up a strong target audience base, you then have to figure out the most effective method of distributing and promoting relevant content to them. Leveraging social media is typically the best way to go. The statistics speak for themselves. Twitter, Facebook, LinkedIn, Instagram, and SnapChat all have increasingly large followings that cater to different demographics. Once you’ve identified your core target audience, start leveraging these social media platforms and use them to your advantage! If you’re still unsure where to begin, then the content and SEO experts at Numero Uno Web Solutions can help you create better content. We’ve helped numerous small- and medium-sized businesses across North America expand their brand awareness and cultivate strong relationships with their online target audiences. Contact us today to learn more!